The Brassroots Brewing Company is the result of a shared pipe dream that slowly turned in to reality. Invoking the spirit of a grassroots movement, we started this company with nothing but a dream and the determination to create a lasting effect on our local beer culture. We pride ourselves on our creativity and desire to push boundaries but as we strive for perfection in our own craft, we're also committed to learning each and every day. The first of many beers that's dedicated to adding something new to the Ontario craft beer network. Darkwood has the characteristics of a classic Belgian Saison (fruity, spicy) with the addition of an understated fruited tartness. 450 lbs. of blackberry puree, shipped in from Oregon, was added to this Saison. 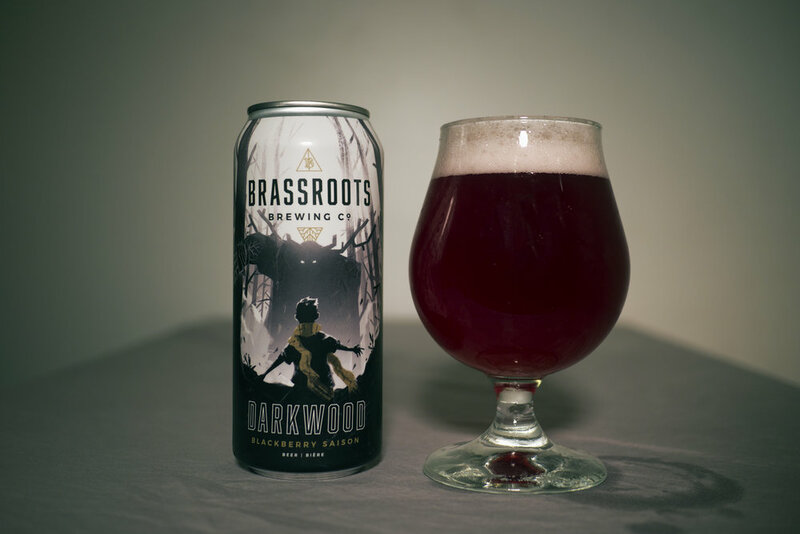 The blackberries give Darkwood a beautifully unique reddish hue and is rounded out by a mild aromatic bitterness imparted by three citrus forward hops: Amarillo, Simcoe and Mosaic. At 4.3% abv. Darkwood maintains a full body while remaining sessionable. Suited perfectly on a hot sunny day.